For the 1933 film, see Sleeping Car (film). The sleeping car or sleeper (often wagon-lit) is a railway passenger car that can accommodate all its passengers in beds of one kind or another, primarily for the purpose of making nighttime travel more restful. George Pullman was the American inventor of the sleeper car. The first such cars saw sporadic use on American railroads in the 1830s; they could be configured for coach seating during the day. Some of the more luxurious types have private rooms (fully and solidly enclosed rooms that are not shared with strangers). Possibly the earliest example of a sleeping car (or bed carriage, as it was then called) was on the London & Birmingham and Grand junction Railways between London and Lancashire, England. This was made available to first class passengers in 1838. The first American sleeping car, the "Chambersburg" started service on the CVRR in 1839. The Cumberland Valley Railroad pioneered sleeping car service in the spring of 1839, with a car named "Chambersburg", between Chambersburg and Harrisburg, Pennsylvania. A couple of years later a second car, the "Carlisle", was introduced into service. In 1857, the Wason Manufacturing Company of Springfield, Massachusetts – one of the United States' first makers of railway passenger coach equipment – produced America's first specifically designed sleeping car. The man who ultimately made the sleeping car business profitable in the United States was George Pullman, who began by building a luxurious sleeping car (named Pioneer) in 1865. The Pullman Company, founded as the Pullman Palace Car Company in 1867, owned and operated most sleeping cars in the United States until the mid-20th century, attaching them to passenger trains run by the various railroads; there were also some sleeping cars that were operated by Pullman but owned by the railroad running a given train. During the peak years of American passenger railroading, several all-Pullman trains existed, including the 20th Century Limited on the New York Central Railroad, the Broadway Limited on the Pennsylvania Railroad, the Panama Limited on the Illinois Central Railroad, and the Super Chief on the Atchison, Topeka and Santa Fe Railway. Interior of a Pullman car on the Chicago and Alton Railroad, c. 1900. In this photo the car is configured for daytime operation. Pullman cars were normally a dark "Pullman green", although some were painted in the host railroad's colors. The cars carried individual names, but usually did not carry visible numbers. In the 1920s, the Pullman Company went through a series of restructuring steps, which in the end resulted in a parent company, Pullman Incorporated, controlling the Pullman Company (which owned and operated sleeping cars) and the Pullman-Standard Car Manufacturing Company. Due to an antitrust verdict in 1947, a consortium of railroads bought the Pullman Company from Pullman Incorporated, and subsequently railroads owned and operated Pullman-made sleeping cars themselves. Pullman-Standard continued manufacturing sleeping cars and other passenger and freight railroad cars until 1980. One unanticipated consequence of the rise of Pullman cars in the US in the 19th and early 20th centuries was their effect on civil rights and African-American culture. Each Pullman car was staffed by a uniformed porter. The majority of Pullman Porters were African Americans. 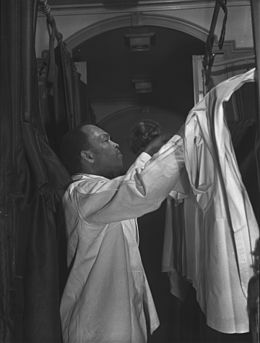 While still a menial job in many respects, Pullman offered better pay and security than most jobs open to African Americans at the time, in addition to a chance for travel, and it was a well regarded job in the African-American community of the time. The pullman attendants, regardless of their true name, were traditionally referred to as "George" by the travelers, the name of the company's founder, George Pullman. The Pullman company was the largest employer of African Americans in the United States. Subsequently, railway porters fought for political recognition and were eventually unionized. Their union, the Brotherhood of Sleeping Car Porters (established, 1925), became an important source of strength for the burgeoning Civil Rights Movement in the early 20th century, notably under the leadership of A. Philip Randolph. Because they moved about the country, Pullman porters also became an important means of communication for news and cultural information of all kinds. The African-American newspaper, the Chicago Defender, gained a national circulation in this way. Porters also used to re-sell phonograph records bought in the great metropolitan centres, greatly adding to the distribution of jazz and blues and the popularity of the artists. Open section accommodations of a Pullman car in day mode, in mid-20th century. In 1964, aging open-section Pullman cars waited in Portland, Oregon, available for "emergencies". 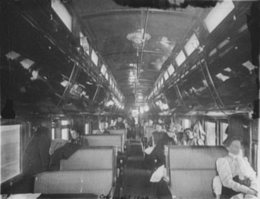 From the 19th to the mid-20th century, the most common and more economical type of sleeping car accommodation on North American trains was the "open section". Open-section accommodations consist of pairs of seats, one seat facing forward and the other backward, situated on either side of a center aisle. The seat pairs can be converted into the combination of an upper and a lower "berth", each berth consisting of a bed screened from the aisle by a curtain. A famous example of open sections can be seen in the movie Some Like It Hot (1959). NH RR's 1942 World War II advertisement "The Kid in Upper 4." This ad depicts an open section of a sleeping car. As the 20th century progressed, an increasing variety of private rooms was offered. Most of these rooms provided significantly more space than open-section accommodations could offer. Open-sections, in the 1950s were increasingly phased out, in favor of roomettes. Some of them, such as the rooms of the "slumbercoach" cars manufactured by the Budd Company and first put into service in 1956, were triumphs of miniaturization. These allowed a single car to increase the number of sleepers over a conventional sleeping car of private rooms. A Roomette, in the historically correct sense of the word, is a private room for a single passenger, containing a single seat, a folding bed, a toilet (not in a private cubicle of its own), and a washbasin. When a traditional Roomette is in night mode, the bed blocks access to the toilet. Like open sections, Roomettes are placed on both sides of the car, with a corridor down the center. Duplex Roomettes, a Pullman-produced precursor to the slumbercoach, are staggered vertically, with every second accommodation raised a few feet above the car's floor level, in order to make slightly more efficient use of the space. Single-passenger slumbercoach accommodations are a particularly spartan form of roomette; slumbercoaches also included a few two-passenger units. 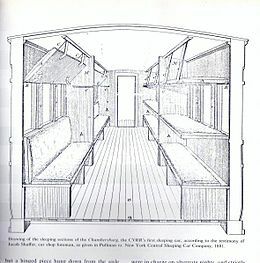 Compartments and Double Bedrooms are private rooms for two passengers, with upper and lower berths, washbasins, and private toilets, placed on one side of the car, with the corridor running down the other side (thus allowing the accommodation to be slightly over two thirds the width of the car). Frequently, these accommodations have movable partitions allowing adjacent accommodations to be combined into a suite. A Drawing Room is a relatively rare accommodation for three people traveling together, again with a washbasin and private toilet, again on one side of the car. Even rarer are larger rooms accommodating four or more; generally the needs of large parties were better served with multiple rooms, with or without the ability to combine them into a suite. Amtrak's Superliner Economy Bedrooms (now called Superliner Roomettes, although they are structurally closer to open sections) accommodate two passengers in facing seats that fold out into a lower berth, with an upper berth that folds down from above, a small closet, and no in-room washbasin or toilet, on both sides of both the upper and lower levels of the car. Effectively, they are open sections with walls, a door, and a built-in access ladder for the upper berth (which doubles as a nightstand for the lower berth passenger). Superliner Deluxe Bedrooms are essentially the same as historic Compartments and Double Bedrooms, with the toilet cubicle doubling as a private shower cubicle. In addition, each Superliner sleeping car has two special lower-level accommodations, each taking up the full width of the car: the Accessible Bedroom, at the restroom/shower end of the car (below the Deluxe Bedrooms), is a fully wheelchair-accessible accommodation for two, with a roll-in cubicle for the toilet and shower; the Family Bedroom, at the Economy Bedroom end of the car, accommodates two adults and up to three small children, without private toilet or shower facilities. When the Viewliner sleeping cars were built, the accommodations were patterned after the Superliner accommodations, except that the Economy Bedrooms (or "Viewliner Roomettes") include Roomette-style washbasins and toilets, as well as windows for the upper berths. Sleeper cars are still popular in the Indian sub-continent, where trains are one of the major mode of transport. Although reduced in prevalence in recent decades in the Western world, sleeping cars retain a powerful ability to provide travel that is both reasonably comfortable and potentially time-saving, especially between points that are between 800 km (500 mi) and 1,600 km (1,000 mi) apart, distances one can travel overnight, perhaps with dinner at the beginning of the journey and breakfast at the end. This offers efficiency in passing the time and distance by allowing travelers to do things that might be done in a hotel room during the same hours. The obvious advantage over day trains (even high-speed ones) is that the ride takes up less daytime. A sleeping car is, in essence, a moving house of lodging. A night in transit can replace a hotel stay at the destination. Even where sleepers are more expensive than high-speed day trains or other modes of transport, the extra cost may be less than that of a night at a hotel. Despite its recent overall decline in popularity, the overnight train still offers an enjoyable means of transportation for many. Many overnight trains arrive at their destination cities in the morning, which advantage is especially pronounced in major cities of China, where hard sleeper prices are very competitive, or in Russia and Ukraine, where sleeper prices are reasonable and the train compartments can be quite comfortable. An interesting practice in sleeping car operation, one that is not currently employed in North America, is the use of "set-out" sleepers. Sleeping cars are picked up and/or dropped off at intermediate cities along a train's route so that what would otherwise be partial-night journeys can become (in effect) full-night journeys, with passengers allowed to occupy their sleeping accommodations from mid-evening to at least the early morning. Common practice on such occasions is to close the passages between sleeper cars for the night to prevent accidental wrong destinations. In Europe, the Compagnie Internationale des Wagons-Lits (French for "International Sleeping Car Company") first focused on sleeping cars, but later operated whole trains, including the Simplon-Orient Express, Nord Express, Train Bleu, Golden Arrow, and the Transsiberien (on the Trans-Siberian railway). Today it once again specializes in sleeping cars, along with onboard railroad catering. In modern Europe, a number of sleeping car services continue to operate, though they face strong competition from high-speed day trains and budget airlines, sometimes leading to the cancellation or consolidation of services. In some cases, trains are split and recombined in the dead of night, making it possible to offer several connections with a relatively small number of trains. Generally, the trains consist of sleeping cars with private compartments, couchette cars, and sometimes cars with normal seating. An example of a more basic type of sleeping car is the European couchette car, which is divided into compartments for four or six people, with bench-configuration seating during the day and "privacyless" double- or triple-level bunk-beds at night. Map of European night trains carrying sleeper and/or couchette cars, 2018. ÖBB's modern Nightjet services operate in Germany, Austria, Italy, Switzerland, and the Czech Republic. The services usually leave at around 20:00 hours and arrive at around 09:00 hours at the destination. In Russia, Belarus, Ukraine, the national rail services operate a large number of night trains with private compartments containing seats convertible into sleeping berths. These night trains are a prime method of travel, with ticket prices quite reasonable by Western standards, and with the distances between the capitals of Moscow and Kiev and many outlying cities being ideal for overnight trips that depart in late evening and arrive at their destinations in the morning. Sleeping cars are the only reasonable solution for railway trips lasting several days (e.g., direct trains from Moscow to Siberian cities). Modern, air conditioned sleeping cars and couchette cars are part of Croatian Railways rolling stock. Croatian sleeping coaches include single, double or 4-beds compartments with washbasin and many additional hygienic accessories. Passengers also have catering services on their disposal and are given complimentary breakfast depending on the type of bought ticket. In Croatia, night train with sleeping carriages included operates on route between two largest Croatian towns, Zagreb and Split. Regarding international transport, Croatian sleeping coaches are included on EuroNight lines Zagreb-Munich-Zagreb and Zagreb-Zürich-Zagreb. Another of the more substantial examples of current European sleeping car service is the Train Bleu, an all-sleeping-car train. The train leaves Paris from the Gare d'Austerlitz in mid evening and arrives in Nice about 8 in the morning, providing both first-class rooms and couchette accommodations. The train's principal popularity is with older travelers; it has not won the same degree of popularity with younger travelers. Recently, the upper class coaches (wagons lits) have been sold to foreign railroad companies, so that only couchette cars (1st and 2nd class) as well as seating coaches remain. The Train Bleu is part of the French night service network called Intercités de Nuit. In Italy, Ferrovie dello Stato operates an extensive network of trains with sleeping cars, especially between the main cities in Northern Italy and the South, including Sicily using train ferry. Sleeping trains in Poland are run by Intercity company. Night trains numbers have been reduced significantly as the quality of the rail infrastructure is declining and repairs are insufficient which leads to longer ride times between cities. A journey started in the Bucharest main station to Arad (599km), usually lasts 11:20 hours when there are no delays. Most night trains in Romania cross the country, covering distances of 400 to 750 km, usually to end at certain international destinations or in large cities at opposite ends of the ountry. The overwhelming majority of night trains with sleeping coaches are owned and operated by CFR Călători. In Spain, Trenhotel is a long distance, high-quality overnight train service which uses Talgo tilting trains technology and sleeping cars developed by the Spanish rail network operator Renfe. It is operated by Renfe when it operates within Spain and Portugal, and by its subsidiary Elipsos (a joint venture between Renfe and French SNCF with a 50% share each) when operating in France, Switzerland and Italy. The Estrella (Star) is a low cost night train between Madrid and Barcelona served by berth carriages, with compartments for up to 6 persons. In the United Kingdom, a network of trains with sleeping cars operates daily between London and Scotland (Caledonian Sleeper), and between London and the West Country as far as Cornwall (Night Riviera). Using rolling stock designed and formerly operated by British Rail, these services offer a choice of single- or double-occupancy bedrooms. These services operate all week, except Saturdays and usually depart London (Euston and Paddington) in the evening, arriving at their destinations at approx 08:00. Both services use British Rail Mk3 sleeper coaches although the Caledonian Sleeper is having their coaches replaced with Mk 5 Coaches. In Canada, all regularly scheduled sleeping car services are operated by Via Rail, using a mixture of relatively new cars and refurbished mid-century ones; the latter cars include both private rooms and "open section" accommodations. In the United States, all regularly scheduled sleeping car services are operated by Amtrak. Amtrak offers sleeping cars on most of its overnight trains, using modern cars of the private-room type exclusively. Today, Amtrak operates two main types of sleeping car: the bi-level Superliner sleeping cars, built from the late 1970s to the mid-1990s, and the single-level Viewliner sleeping cars, built in the mid-1990s. Superliners are used on most long-distance routes from Chicago westward, while Viewliners are used on most routes east of Chicago due to tunnel clearance issues in and around New York City and Baltimore. In the most common Superliner sleeping car configuration, the upper level is divided into two halves, one half containing "Bedrooms" (formerly "Deluxe Bedrooms") for one, two, or three travelers, each Bedroom containing an enclosed toilet-and-shower facility; and the other half containing "Roomettes" (formerly "Economy Bedrooms" or "Standard Bedrooms") for one or two travelers; plus a beverage area and a toilet. The lower level contains more Roomettes; a Family Bedroom for as many as two adults and two children; and an "Accessible Bedroom" (formerly "Special Bedroom") for a wheelchair-using traveler and a companion; plus toilets and a shower. The Viewliner cars contain an Accessible Bedroom (formerly "Special Bedroom") for a wheelchair-using traveler and a companion, with an enclosed toilet-and-shower facility; two Bedrooms (formerly "Deluxe Bedrooms") for one, two, or three travelers, each Bedroom containing an enclosed toilet-and-shower facility; "Roomettes" (formerly "Economy Bedrooms", "Standard Bedrooms", or "Compartments") for one or two travelers, each Roomette containing its own unenclosed toilet and washing facilities; and a shower room at the end of the car. China Railway operate an extensive network of sleeper trains throughout the country, covering all provincial capitals and many major cities. With track upgrades, service speeds have increased; since 21 December 2008, a high-speed CRH2E sleeper train service even runs between Beijing and Shanghai. Upper and lower berths have different prices; in 2008, the difference was between 730 yuan for the lower berth and 655 for the upper berth. The Chinese "hard" sleeping car in use today is very basic, consisting of 6 fixed bunk beds per compartment, which can be converted into seats in peak season, especially during Chinese New Year. The middle level bunk bed will be folded and top level bunk bed will still be sold as sleeper, while the lower bed will be occupied by three passengers. Chinese trains also offer "soft" or deluxe sleeping cars with four or two beds per room. A major portion of passenger cars in India are sleeper/couchette cars. With railways as one of the primary mode of passenger transport, sleeper cars vary from economical to First Class AC (air conditioned). Most Indian trains come in combinations of first class A/C and non-A/C private sleeper cars with doors, and A/C and non-A/C 3-tier or 2-tier couchette arrangements. Keretapi Tanah Melayu, the Malaysian national railway company, offers sleeping car service on several of its long-distance trips. Sometimes the same trip can be made either during the day in a normal carriage or at night on a sleeper. The Kuala Lumpur to Hat Yai train has sleeping cars, since the journey takes 14 hours. Sleeping cars on The Ghan near Alice Springs in 2015. Sleeping cabin of a NSW TrainLink XPT in 2013. Great Southern Rail's east-west transcontinental train the Indian Pacific between Sydney and Perth, and the north-south transcontinental train The Ghan between Adelaide and Darwin. NSW TrainLink's overnight XPT services from Sydney to Melbourne, Casino and Brisbane. Queensland Rail's long distance trains the Spirit of Queensland and Spirit of the Outback. ^ "St. Paul 'Pullmans'". TIME Magazine. June 6, 1927. Retrieved 2008-05-28. ^ "Firsts". Springfield 375. January 31, 2011. Archived from the original on March 14, 2012. Retrieved 2013-05-23. ^ Bianculli, Anthony J. (2002). Trains and Technology: the American Railroad in the Nineteenth Century. Vol. 2, Cars. Newark, Del. [u.a. ]: University of Delaware Press. p. 52. ISBN 0-87413-730-6. ^ Grizzle, Stanley (1998). The Story of the Brotherhood of Sleeping Car Porters in Canada. Toronto: Umbrella Press. pp. 20–23, 39–42. ^ Schoenberg, Loren. "Race Records". www.pbs.org. Public Broadcasting Service. Retrieved 5 December 2014. ^ "Essential Guide to Classes of Travel on Indian Railways Trains (with Photos)". TripSavvy. Retrieved 2017-09-07. White, John H. (1985) . The American Railroad Passenger Car. Baltimore, Maryland: Johns Hopkins University Press. ISBN 978-0-8018-2743-3. Martin, Andrew (2017). Night Trains: The Rise and Fall of the Sleeper. London: Profile Books. ISBN 9781781255605. Wikimedia Commons has media related to Sleeping cars (rail transport). Wikivoyage has a travel guide for Sleeper trains. The Abraham Lincoln 1910 Heavyweight Pullman Business Car — photographs and short history. Canadian National Railways Sleeping Car No. 1683 St. Hyacinthe — photographs and short history of a Sleeping Car built in 1929.